Cyprus offers great birding with the focus on spring and autumn migration. This visit was late in the autumn, so I knew most of the summering birds would have gone south and I was on the cusp of the arrival of its wintering birds. Nevertheless, birding was far from dull and it was good throughout. Highlights included the Falcons, the graceful Eleonora's Falcon and the busy Red-footed Falcon stole the show. I was lucky to see the latter, to be honest they were off my radar as I thought they could have moved off south by the time of this visit. It was instructive to study the Falcons in flight especially at distance. Birding Asprokremmos Dam a few kms east of Paphos tested this out. How easy is it to identify an Eleonora's Falcon flying over a Dam at distance? Is it the structure that gives it away, how long is the tail, is it the dark underwing coverts to look for on the majority of them, or should you concentrate on the languid glide that quickly turns into a very fast pursuit of prey within seconds? What's the significance? Well, trying to put myself in the very unlikely situation (and you may say daft proposition) of watching a funny Hobby type Falcon flying in-off say at Spurn, Flamborough or out along the wind farm backdrop to Titchwell. 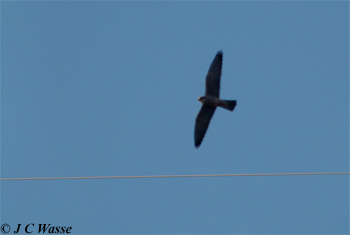 The view that makes you think that doesn't look right for Hobby but it's not a Peregrine. Could you call out an Eleonora's on such a fly by? Back to 'Aspro. Dam' which also held a feeding flock of Red-foots one evening, whizzing around like clockwork toys, but what about the not so whizzy Falcon amongst them in the glow of the low evening sunlight. It was a bit broader in the wings, dull underneath and easy to follow when videoing, was that significant? It was a Hobby. Whilst the situation may be reversed back home, trying to find a silhouetted Red-foot amongst a feeding Hobby flock over an inland marsh one May, will the size give it away or the flight style instead? Anyhow, moving on from Falcons, the birding was varied, mostly coastal or just inland. Whilst the sea was quiet, it did offer Scopoli's and Yelkouan Shearwaters, although the views were not as good as in October 2016. Enjoy the trip report (pdf), please click on 'Birding Trip Reports - Other' tab at the top of the blog and it's the first one at the top of the Europe section. Trip report makes reference to the excellent Gosney Guide - Finding Birds in Southern Cyprus (2010) which still offers a good baseline for planning your birding, as does Stagg and Hearl's 'A Birdwatching Guide to Cyprus'. Video compilation to follow, especially of those whizzing and not so whizzing Falcons. Finally, thanks not only to birders online and in the field who helped me throughout, but to all of those involved with preventing bird slaughter in this area, and promoting conservation - CABS and Birdlife Cyprus immediately come to mind. Their unrelenting dedication needs to be acknowledged and promoted.